Life can be pretty annoying when you are affected by seasonal allergies. Trust me, I know from experience. If you aren’t blowing your nose you’re squinting your eyes because of the sinus pressure it can cause. There are a number of different treatments for these special annoyances, be it over the the counter or prescription. If you found yourself on this page however, you might be wondering if air duct cleaning can help. The answer is really yes and no. There are so many different types of allergies that get falsely categorized as “seasonal allergies”. In many cases the main culprit is pet allergies including pet hair and dander. In more severe cases you can find yourself calling seasonal allergies what really is a mold contamination situation. That is not a good situation to be in at all. If your allergies are not misdiagnosed than, yes, air duct cleaning might be able to help alleviate your symptoms while inside your home. That goes for the pet hair and dander as well. Over time the air ducts in your home build up debris including the aforementioned pet stuff but more acute is the pollen from season to season. Each time your forced air heat system turns on the loose debris is distributed through your home which then enters your respiratory system. I bet you can guess what that causes, seasonal allergy symptoms! If that is the case for you and the air ducts in your home haven’t been cleaned in the last three years, duct cleaning Chicago style might not be a bad idea. The air duct cleaning process we follow uses the power of compressed air (180 psi of pressure) and unique agitation fittings to scrub the interior walls of your ductwork and push the debris down to powerful HEPA vacuum located down at the location of your furnace. When the job is done the right way, which the only way Better Air Chicago knows how to do it, the entire air duct system is fully removed of all harmful debris which pollutes your indoor air. We have had many customers claim to have given up on seasonal allergy medication like Zyrtec after our quality air duct cleaning. Likewise, we have had customers say they didn’t see too much of an impact. In those cases it typically is not just a seasonal allergy that is causing the respiratory problem. It’s hard to say what it is but in many cases it is caused by some sort of a bacteria or fungus living in your air ducts. If that is the case there is an additional service that might be worth considering. It is called Anti-microbial Sanitation. It is a safe process that washes the interior walls of your air duct system with a powerful disinfectant by the name of Sporicidin. Both air duct cleaning and anti-microbial sanitation are a cost effective way of controlling the indoor woes of seasonal allergies. It’s certainly worth a shot. Injury to the anterior cruciate ligament (ACL) of the knee is not uncommon. A variety of different injuries may play a role, but the classics include skiing, basketball, and football. As our understanding of the role the ACL plays in biomechanics of the knee improves, so has our understanding of the mechanisms of injury. Specifically, in the examples mentioned, snow skiing and snow boarding equipment directly loads the ACL which in turn renders the ligament more susceptible to injury. While womens basketball is more complicated, anatomical and athletic biomechanical factors have been demonstrated to be responsible for the almost epidemic level of ACL injury in female basketball! No mistake, the ACL is vital to a properly functioning knee. As a ligament, the ACL connect two bones, the femur (thigh), and the tibia (shin) bones. The knee has four primary ligaments functionally, and each are important, but the ACL is the one that stabilizes the relationship of the bones under quadriceps muscle (or extension) loading. The quads are the muscles in the front of the thigh that straighten the knee, hold us up when standing or walking, and allow us to jump. When they contract, they place forces across the knee that the resistance of the intact ACL allows to be translated into normal extension of the knee. Without the ACL, the relationship between the femur and tibia is distorted, and abnormal forces are placed through, and into, the knee joint. These abnormal forces are therefore at work with simple standing, walking, and getting out of a chair, and greatly magnified with running, jumping, and cutting. The distortion of the position of the bones leads to collapse or ‘giving way’ of the knee. Very inconvenient, but worse the constant shifting in the knee causes deterioration of the meniscal cartilages in the knee. These cartilages fit between the bones and are the shock absorbers and load sharers of the joint. 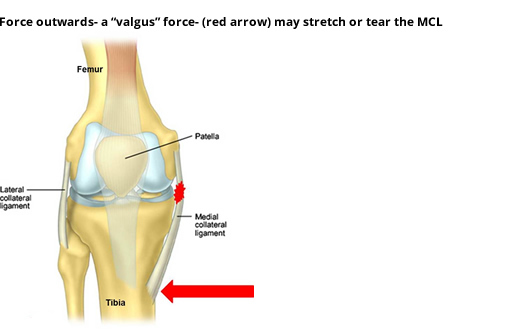 When the meniscal cartilages go, the surfaces of the joint accrue damage and the knee becomes arthritic. It is important to understand this degenerative process can be accelerated if the cartilages, or the joint surfaces, are damaged at the time of the original injury as well. This concomitant damage is actually typical, and represents a serious challenge to the long term health of the joint. Let’s get one thing out of the way. Ladder agility exercises have nothing to do with climbing ladders! Remember playing hop scotch when you were a kid. Well agility ladder exercises is kind of like that. These days some call it multi-directional training but whatever you call it ladder exercises are outstanding for building speed, agility, coordination, balance, strength and stamina. So, very much worthwhile including in you training regime. Athletes and sportsmen and women have been doing variations of agility ladder exercises for years. Or you can get some chalk or tape and just mark your ladder out on a flat piece of ground. There should a minimum seven ‘rungs’ in you ladder (more if you have the space) each step being around 40cm square. And that’s it. That said, if you can’t be bothered marking out your ladder each time or would prefer to have something more portable, them make your own out of some good rope. There is a benefit of having a rope ladder in that it helps prevent you from ‘stepping on the line’ and with that give greater concentration and focus on your foot movements. Agility Ladder Exercise Drills can be as varied, interesting and fun as you want to make them. The important thing to ensure is that the drills you choose gives you a full range of linear movement. As long as you start slow and build up speed slowly as you become better and more coordinated. You can even you ladder exercises for upper body workouts but more of that later. There are no hard and fast rules as to when you should incorporate ladder exercises into you workout routine. What I tend to do however in my classes is to put them in at the end of a session. There are a number of reasons for this but in the main I find when people are getting fatigued, it’s good to throw in something different and something they have to think about. Just a little on upper body exercises using agility ladder exercises. This is a cross between a plank and a press up, giving the benefits of both while also improving hand and foot speed and coordination. The key thing to remember is to keep your back straight. Don’t raise or lower your hips or this will create strain on your lower back in particular. Spring is here and that means time to get some serious football conditioning drills going, but before you undertake any training or conditioning drills always consult with your doctor first and get an up to date physical to make sure you are healthy for training and the up coming football season. I realize I’m in the minority here, but, I’ve always loved conditioning. I can still vividly remember being out on the track or in the field after every weight room session…or in the morning…I don’t know why, but I understood early-on that conditioning football conditioning drills makes one hell of a difference. Those who can play in the 4th like they did in the 1st usually win. I was first introduced to balance exercises when recovering from an ankle and lower back injury. With a ski-ing holiday booked, and not wanting to miss out, I need to get fit and quick so I needed to try something that was different for me. My trainer at the time suggested that part of the reason I was having recurring injuries was because my balance was poor. In truth, this wasn’t something I had considered and didn’t think was a problem until he give me some simple tests. It’s kind of like a sobriety test, try it and see how you get on. Stand up straight putting one foot in front of the other heel to toe keeping both feet flat on the ground. Close your eyes and see if you can hold that position perfectly still for 20 second. How did you get on? Not as easy as it sounds is it. Another balance problem I have seen is if you use free weights when exercising. With weight training, keeping perfect form is important, not only so you are getting the maximum benefit from the exercise but also to prevent injury. I’ve always had a balance problem when doing single leg calf raises. Since doing balance exercises, this has improved dramatically, as has the amount of weight I can use. A real plus for balance exercises is that you don’t need and fancy equipment so they can be done any time anywhere. A kitchen chair is useful just to steady yourself when starting out. But that’s pretty much it. You can invest in a balance ball (which looks like a ball cut in half on a flat disc) if you wish. I have to say, they are very good but not inexpensive. See what works best for you. What are the benefits of balance exercises? There are many benefits form balance exercises. They are not just for the serious athlete but also if you just want to maintain a good general standard of fitness. There are a number of ways that thinking about you balance can help when doing different forms of exercise too. Sometimes if I’m doing bicep curls with dumb bells, I’ll sit on a Pilates Ball. I find that by doing this and having to keep balanced, it stops the temptation to swing the weights so I keep better form throughout the exercise. I also find a secondary benefit to my abdominals and overall core strength and all you muscles are making small adjustments to keep you balanced on the ball. After a short time, just a few weeks, you will begin to see measureable improvements in you coordination and ultimately you will become a better and stronger player in your chosen sport. And that from just a few minutes a day of balance exercises. How to start balance exercises? Start slowly by just adding 5 or 10 minutes of balance exercised to the end of your work-out routine two or three times a week and work up from there. You will be able to tell is your balance is improving by the length of time you can hold a position and good form without wobbling. Stick to the basic exercises. Don’t try anything too advanced or anything that causes discomfort. Ease yourself into the exercises. As you improve, add some small weights into the routine. Remember to concentrate on you abs. Pull the tummy in and use you core muscles to help you balance. Try closing your eyes to help focus on being balanced. Balance exercises are as easy not to do as they are to do! They’re not as macho as lifting weights and perhaps not as satisfying as completing a 10k but trust me on this one. You will improve every exercise you do and every sport you play if you improve your balance. Many patients present all of the above symptoms. For our study we will call our patient Lucy. Lucy’s smile is very characteristic of a woman in her late 40s or early 50s with a minor sleep-time grinding habit. This slowly wears the edges of the front teeth creating “small teeth” and a old/worn appearance. The loss of height in the tooth structure also accentuates the wrinkles in the smile line. Lucy’s is also missing a molar tooth – which is apparent in her smile due to her wide smile line. Our objectives were to correct all of her issues and discrepancies. Comfort. Function. Esthetics. All three of these are equally important. Pick any two of these goals, and omit any single one, and the procedure is a failure – the patient is miserable in some form or fashion. When faced with multiple, complex issues like Lucy, we are forced to work on all of the teeth at the same time. This gives us complete control of every aspect: color, shape, and alignment. Before we do any of this work on Lucy, we do all of our proposed work on a simulated version of Lucy’s teeth and jaws, fabricating all of the final dentistry and porcelain work in a diagnostic wax form. This allows us to “pre-view” the result and possibly identify and short coming before we treat Lucy. In Lucy’s case our initial appointment was about 4 hours long. We prepared all remaining 27 teeth in Lucy’s mouth. We also removes 1.5 mm of gum tissue with a laser. Lucy left that day with temporary crowns and veneers made from composite (plastic) resin. Lucy’s temporaries were modeled after our proposed final shape and alignment. In other words, Lucy left with a smile makeover – not 100% there, but about a 50% improvement. Two weeks later Lucy was reappointed for another 4 hour appointment. At the second appointment all of Lucy’s crown, bridge, and veneer work was placed. Some components were placed with permanent adhesive, other components (related to the bite and TMJ issues) were placed with a trial adhesive. This trial adhesive allows us to remove certain components of Lucy’s dentistry at a later date if certain symptoms remain or do not subside completely over time. Here is a list of the work done on Lucy. If you examine the before and after pictures closely, you will notice an difference in color, length of the teeth, the absence of excessive gums in the smile, the width of the smile within her lips, the additional molar on her upper left smile now showing, and the overall youthful appearance of Lucy ~ stunning! Remove the skin from the mango before you freeze it, cut it into large chunks.Ripe and slice the banana before you freeze it. Then mix all of the ingredients in a blender. Blend until smooth. Tip: Use lime juice if you have it.